If we had to pick an A-Team of attachments, the five implement categories mentioned above would be our weapons of choice. Of course, we mean no disrespect to pallet forks, which are ultra-productive attachments, but we kicked forks off the squad because he’s boring and boasts few options to discuss (besides material quality). Skid steers and track loaders can run hundreds of these unique implements — hydraulic attachments like backhoes and brooms and non-hydraulic tools such as buckets and pallet forks — but it’s impossible for you to own them all. So, which ones do you choose? Hydraulic earth augers are one of the most popular attachments available for skid steers and track loaders. Their power, productivity and ease-of-use have made them a go-to solution for precise digging projects. Dig depth on these augers is dependent partially on the host machine, but typically auger attachments can reach a dig depth up to 72 in. Wanna go further? Extensions are available to go even deeper. But before you start digging, the first steps in making sure an earth auger attachment will perform as desired is to ensure the attachment is compatible with its power source. This means the skid steer and track loader must have adequate hydraulic flow and pressure ratings in order to provide enough power to the attachment. Auger drives will be an important decision. Rotation is powered by a planetary, chain or direct drive. Planetary drives are the most expensive drive type but offer the most power for tough jobs. Chain drives are less expensive than planetary drives and, while not as powerful, do have enough oomph for most chores. If you want a lot of holes at the lowest investment cost, a chain drive might be just the answer. The lowest-cost option is the direct drive, though this design is typically limited to smaller machinery-types and lighter-duty applications. Auger drives are sized according to hydraulic flow rate, which dictates the power supply to the attachment. On the low end of the scale, drives with best operating flow rates between 10 and 14 gpm accommodate smaller bits. Models at the upper end might provide flow in the 30- to 45-gpm range and are needed to operate monster auger bits between 36- and 48-in. diameters. Besides drives, auger bit options are important. These come in a variety of styles with varying capabilities. Lighter-duty bits will work well in non-compacted, loose soil. Heavier-duty bits might be used for compacted or frozen ground and clays. Digging a big hole doesn’t mean you have to be buried in large expenses or missed timelines. While digging trenches, footings, basements and drainage ditches are tasks you often assign to your mini excavator, a skid steer or track loader backhoe attachment can make your tool carrier a new multiple-personality taskmaster. Backhoe attachments can be operated either inside or outside of the cab and/or incorporate the loader’s controls or have their own dedicated controls. Each backhoe brand seems to have its own productivity capabilities and operational style. Although boom-control backhoes (those operated with the skid steer’s levers) leave something to be desired in the way of its approximate arm reach and breakout force, the single-cylinder design to operate the bucket curl takes it easy on the hydraulic system and only requires between 11 and 22 gpm. They are also easy on the wallet, generally starting around $1,800 with an 8-in. bucket and then going up in cost depending on options. Taking backhoe versatility one step further, some backhoe attachments come with their own set of controls that can be used in your machine’s cab or by sitting outside the cab. Patterned in either ISO or SAE operating patterns, this style of backhoe attachment can rival the specifications of a dedicated compact excavator. However, the increased versatility makes more demands on your loader and wallet — costing around $12,000 to purchase. For skid steers with out-of-the-cab controlled backhoe attachments, the operator will need to exit the skid steer cab and saddle up onto the seat provided by the backhoe attachment. Perched atop of the attachment, the operator has excavator-style controls to manipulate the attachment, with dig depths up to around 11 ft. Vertical stabilizers and stabilizer pads, buckets ranging from 8 to 40 in. and boom attachments like thumbs can also be considered. When trenching holes through tough terra firma, it’s important to find a balanced trenching tool for your application. 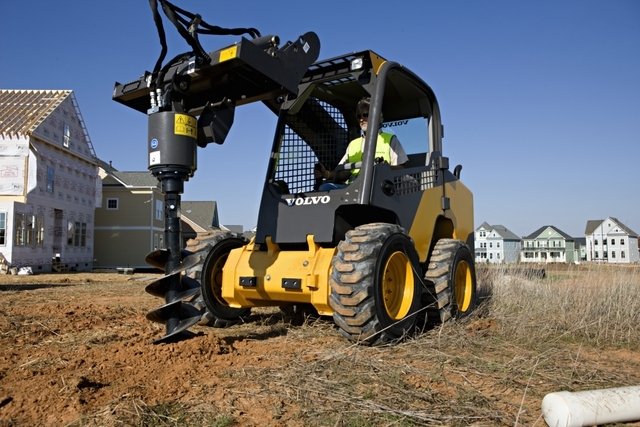 When it comes to landscaping, farming, light construction and even homeowner repairs and installations, the proper skid steer or track loader trencher can be a powerful tool. Because of the expense, it’s important to analyze your needs and expectations by determining a few important factors. One of the most important things to consider is the trencher’s depth and width for the application. Most trenchers are designed for a number of applications, so be sure to determine all of your application needs before you rent or buy your trencher. This will help in determining the model trencher that is the right one for you. Even a small skid steer can trench depths up to 36 in. and widths up to 10 in. wide. If your areas of application are larger, you can select trenchers for larger skid or track loaders with digging depths ranging from 24 to 60 in. and widths ranging from 6 to 12 in. Because trencher attachments operate on flow and pressure, it’s important that you know your host machine’s capabilities. Typical flow and pressure requirements for small skid steers range from 8 to 20 gpm with hydraulic pressures ranging from 1,750 to 3,000 psi. Typical flow and pressure requirements for mid-size to large skid steers or track loaders range from 10 to 40 gpm with hydraulic pressures ranging from 2,000 to 4,200 psi. Most trencher manufacturers offer a variety of digging chains. Because soil conditions vary from location to location, matching the digging chain with the soil conditions can make all the difference in a successful trenching operation. Most manufacturers offer digging chains for usage in almost all soil conditions and in almost all weather conditions. Some of the most popular digging chains are: the standard chain, recommended for loose or damp soils; double anti-back flex chain, recommended for harder or drier soils; full rock and frost chain, recommended for frost or rocky soils; half rock and frost chain, recommended for harder or mixed rocky soils; and a terminator or bullet chain, recommended for very hard and dry soils. Most trencher manufacturers offer many features and benefits. Some feature direct motor drives and others feature chain reduction drives. Direct drives often offer more chain speed but lose out in long-term durability and the all-important area of torque. Heavy-duty chain reduction drives (similar to those that propel skid steer loaders) offer a dependable and economical method of maximizing digging power at an affordable cost. Most skid steers and compact track loaders sold today come with what’s called a general-purpose bucket — commonly called a dirt bucket. Combining a lower capacity (typically 10 to 20 cu ft) with a durable construction, dirt buckets are used for moving dirt, rocks and heavier materials such as sand, gravel and castings. Almost everybody has a dirt bucket and almost every manufacturer uses its dirt bucket for performing skid steer testing and rating — breakout forces, lift capacities and operating loads. The dirt bucket has a rolled back vs. a flat back, allowing the operator to spread material with ease, but it’s certainly not the only bucket in the skid steer/track loader business. Combination Bucket — This multi-function attachment can be used as: a bucket for loading, carrying and dumping; a grapple to handle odd-shaped objects like logs and stumps; or a clamshell for dozing, leveling and spreading material. Combination buckets can be purchased with or without teeth, and some models feature replaceable cutting edges on the rear of the clamshell and dozer blade. Concrete Placing Bucket — Designed to accurately, quickly and neatly carry and place concrete in tight areas that cannot support a cement truck. The concrete placement bucket is ideal for pouring backyard patios, footings or formed columns. Typical sizes available are 1/2- and 3/4-cu yd capacities. Auger Mixing Bucket — Designed to transport and dispense concrete and also eliminate the hard labor of actually mixing cement. It can also be used with wildlife feed, sand, asphalt, agricultural grains and washed gravel (usually 3/4 in. max). Some units have a quick-attach frame on either side to control discharge from the left or right and come with a 2- or 3-ft chute, hoses and couplers. Grapple Bucket — When you need to get a firm grip on a large object (like a rock or log) or you need to move a pile of odd-size spoils (like in demolition), a grapple bucket is an ideal alternative. Two grapple arms with separate cylinders allow the top portion of the bucket to handle uneven loads. Some grapples are designed with an open area underneath instead of the traditional bucket floor plate, which allows fine material like dirt to fall through. Light Material or Snow Bucket — Designed for moving “light” materials such as snow, mulch and other landscaping materials and some agricultural products like feed and manure. These are generally the highest capacity buckets (typically 13 to 60 cu ft) — often engineered with straight sides to penetrate snow, mulch, bark chips and other materials. These buckets are great for landscapers doing big jobs, used mostly for bulk material loading or plowing. Low-Profile or Grading Bucket — These buckets give the best visibility of the cutting edge, but have a relatively lower capacity (typically around 10 to 18 cu ft). Low-profile buckets are used for mostly dirt applications — especially for grading jobs, because of their good visibility. But the bucket’s smaller bucket height with its longer extension to the bucket front can reduce the rated lift capacity. Rock Bucket — When a job calls for sifting and sorting of material, clearing stones from open land or removing larger pieces of debris from jobsites, it pays to have a rock bucket option. Rock buckets are designed to retain rocks and debris during digging and grading, while returning finer soil or dirt to the site. At a quick glance, they look like buckets with slats in the bottom, top and sides. Several types of rake attachments are available for skid steer and track loader owners, and depending on your job requirements, each offers specific benefits. Finding the right rake attachment for your needs can increase your productivity, so let’s figure it out. When starting a landscape or dirt project, you first need to create manageable soil if it isn’t already present. Grader rake attachments for skid steers and track loaders feature strong, evenly spaced tines designed to separate debris for site cleanup and scarify and level compacted soils. Grader rakes are best for applications that require the clearing of coarse materials such as sticks, bricks, rocks and roots on a jobsite. It is not recommended for preparing soil for grass seeding because its tines create long striations that allow seed to fall too far into the ground, creating stripes in a lawn — a landscaping faux pas. 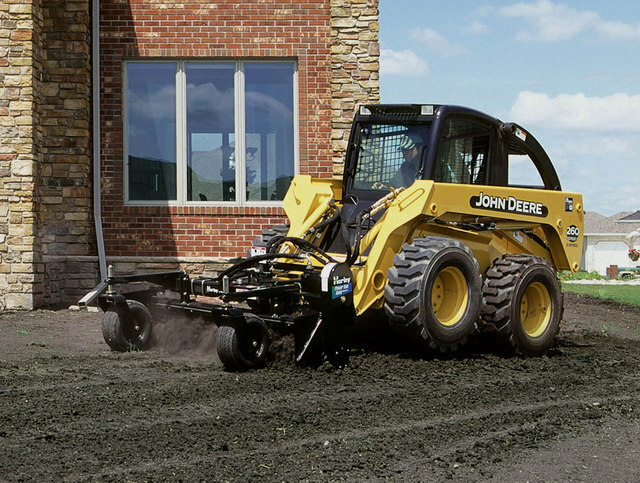 Once you’ve cleared away excess debris from your jobsite and have it leveled to the appropriate grade, you can begin preparing your soil for seeding. Auto rakes utilize a bucket with either a rake chain or a bar with teeth on it to remove smaller rocks and debris from loose soil and sift the surface layer of the soil to effectively groom and finish it for seed or sod. Unlike the grader rake, an auto rake can collect, transport and dump debris quickly and easily. Before using an auto rake attachment, be sure that the area is free of all boulders larger than roughly 6 in. in diameter, logs and large tree branches, wire, lumber and any other item that is too large for the bucket or could get wrapped around the rake chain. It is also important to make sure that the soil is relatively loose and that any compacted areas have been tilled with another piece of equipment to a depth of 2 in. or deeper. A preparator rake can do even more. This one attachment combines the cleanup, rock removal and soil preparation capabilities of the grader rake and auto rake into one easy-to-maneuver rake attachment. Its rotating bi-directional drum carries rocks and debris into the perforated bucket, which efficiently sifts dirt to till and fluff the ground as it grooms the soil. Use a preparator rake for the following tasks without switching between attachments: rock collection, foliage removal, soil tillage and roughing (rake rocks, debris and foliage and scarify and fill depressions in tilled or untilled soil). Of course, the most versatile rake attachment around would have to be the power box rake attachment. Power box rakes combine four attachments into one, allowing you to grade, level, rake, remove debris and prepare bare ground for seed or sod. Power box rakes can also be used to dethatch and remove old lawns and weeds for lawn renovations. Power box rake attachments are equipped with rollers that have specially shaped carbide teeth designs and patterns that release the optimal amount of moisture from the soil, creating an ideal seedbed. It has a “barrier” that adjusts so the operator can control the practical size of the workable loom on the site and material left in the seedbed depending on the soil moisture conditions — allowing for faster drying in wet and muddy conditions. Keith Gribbins is managing editor of Compact Equipment, based in Brecksville, Ohio. My husband has been looking at skid steer attachments to rent for our home remodel. I think it’s great that many attachments, like trenchers, are designed for a number of applications. I’ll be sure to let him know about these must-have attachments for our project. are an expert on this subject. Fine with your permission let me to grab your feed to keep up to date with forthcoming post. I have a skid steer attachment that was invented by my father and my son and I have been trying to get on the market for just over a year. We have had tremendous interest but no sales to date. We are searching for a manufacturer that would purchase our assets (working prototype, engineered drawings, marketing materials and contact list) and actually produce and sell some units. You can find out more information about our attachment on our website, skidcrane.com. Would your company be interested in this type of arrangement? I look forward to hearing back from you.